I was trying to figure out just why I was enjoying this film so much – and, by extension, why audiences generally have loved it. Was it just because it was an upbeat musical, a throwback to the golden age of Hollywood, and thus nothing like 99% of the big cinematic releases of 2016? Were we just excited to see something that didn’t feature superheroes in silly costumes being deathly serious? 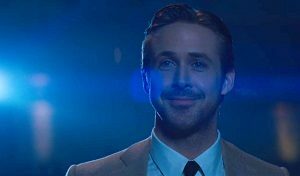 Was La La Land actually good on its own terms? And for most of the film, I was unsure. Ryan Gosling and Emma Stone – you get these two on a screen together and the film’s bound to be great, yeah? Gosling is effortlessly cool whilst Stone is effortlessly likable, and these two very pretty people are at the top of their game right now. Sure, the direction by Whiplash‘s Damien Chazelle was strong, but still I had this nagging feeling that I was only enjoying La La Land because it was different. Then the final act happened, and I was sold. It was only in that portion that the film truly excelled, and showed us something different, and I loved it. Importantly, the songs were excellent. They are spread unevenly throughout the film – sometimes the singing is bunched together, other times we get nothing but dialogue for close to half an hour – but above all, I was pleased to discover that they weren’t very literal. I don’t have an aversion to musicals, but I do have a problem when a song’s telling me something the story’s already made clear. Here, however, the lyrics are worthy of multiple listens. Stone plays an aspiring actress, Gosling plays an aspiring jazz musician. Together, they’re mourning the death of their art. The film itself is a love letter to Old Hollywood, and there’s a particularly impressive role in here for singer/songwriter John Legend, who is kinda making fun of himself, but not quite. At 128 minutes, the film isn’t short, but it flowed effortlessly for me. The only negative is that the first and second act aren’t anything particularly fresh. But who can really complain when the talent in front and behind the camera is so good? This entry was posted in Film Reviews and tagged Drama, Musical, Romance, Romantic Comedy by Stuart Wilson. Bookmark the permalink.